Unique, resort-style accommodation nestled in spacious sub-tropical gardens. Minutes off the Byron Bay tourist trail, between the hinterland and magnificent eastern coastline lies Byron Retreat. Hidden amidst a canopy of lush sub-tropical gardens, you'll want for nothing during your retreat at this self-contained luxurious hideaway. Whether you're holidaying with family and friends, or just seeking a quiet escape for two, Byron Retreat will provide you with the perfect location for a wonderful break. Set on 6000 square metres of sub-tropical gardens, the property is located in a secluded, quiet street, yet close to all the delights of the far north coast. The house is spacious and relaxing, and guests choose to stay to enjoy the privacy, as well as the close proximity to Byron Bay. The spacious, open layout features a fully equipped kitchen, allowing you to enjoy your own gourmet meals either in the dining room, or outdoors in the Mexican-inspired barbecue and entertaining terrace. Relax by the pool, even in the cooler months, as the pool is heated to 28 degrees. At night snuggle up on the lounge in front of the central stone fireplace and watch a movie from the collection of hundreds of new release and classic titles, or choose a book from the library. Your iPod can be plugged into the stereo docks located in the lounge and bedrooms. The house can sleep up to six adults in three bedrooms, two with luxurious King Size beds and one with a Queen. Two additional single beds for children can also be made up on request. The bedrooms are equipped with reverse cycle air conditioning and electric blankets. The east bedroom overlooks the pool area and Bali hut. Two cots, a high chair, stroller and Bumbo baby seat are available at no extra charge. Byron Retreat's popularity with families is demonstrated by the number of repeat bookings from families who choose it as their holiday destination - whether it's for one family, or several families and friends holidaying together. Children will think it's paradise, with a 12 metre heated pool (which is securely fenced), cubby house, Springfree trampoline (with safety net), swing, full size outdoor table tennis table plus plenty of space to run around, play hide and seek, kick a soccer ball or have a game of backyard cricket. Indoors, a dedicated toy cupboard and rumpus room, movie library and games provide hours of amusement. Parents will love the built-in BBQ and outdoor entertaining area or watching the kids by the pool in the Balinese hut or poolside recliners. And if you'd like to explore the surrounding area bikes are also provided at no additional charge. A complimentary welcome basket featuring locally produced Ewingsdale coffee, Byron Bun Tea and Gingerbread Folk biscuits, provides an opportunity to unwind after a long drive, before heading off to the supermarket. Sanctum toiletries are provided in each of the bathrooms and all linen and bath towels are supplied... so no need to load up your luggage with linen and towels or make up beds when you arrive. Byron Retreat has partnered with Ripple Massage to offer day spa services during your stay. Enjoy a relaxing massage by the pool, in the gardens or anywhere in the privacy of your accommodation and receive a complimentary early arrival or late departure. Our two and three night tariffs also come with a complimentary early arrival or late departure - giving you extra time to enjoy your stay. And if you do need to check on emails or use the internet, complimentary Wi-Fi is available. There is undercover parking for three cars and the property can accommodate wheelchairs. Full details and additional photos for accessability can be provided on request. Your retreat at this exclusive property, whether it be for a weekend for two or a getaway with family and friends, is bound to be a magical experience. 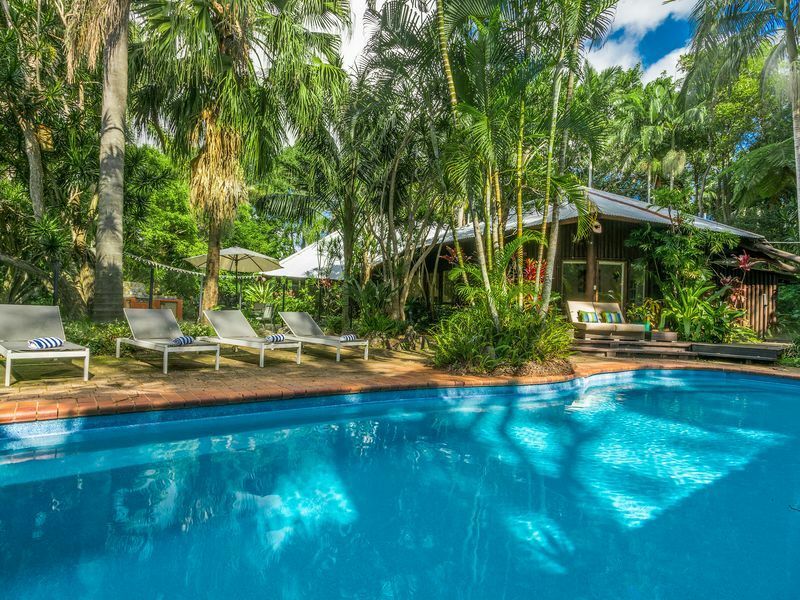 Located in Ewingsdale, Byron Retreat is sheltered from the busy hub of Byron Bay - giving you plenty of space to unwind and rejuvenate in a tranquil secluded environment. Yet the town and beaches are just a short drive away -- enjoy a tantalising array of restaurants and cafes, including The Farm, shopping, sightseeing tours, the renowned regional markets, Byron's eclectic Arts & Industry Park, the picturesque village of Bangalow and surrounding hinterland - and of course the magnificent surfing beaches and relaxed Byron lifestyle. Byron Retreat gift vouchers are available for you to spoil friends or family. Combine with a Ripple massage day spa package for an extra indulgent stay and receive an early arrival or late checkout (subject to availability). Vouchers are valid for two years from the date of purchase and can be redeemed for any time of year, subject to availability and the applicable tariff being met. The following are the standard terms and conditions of holiday accommodation at Byron Retreat. Variations to these conditions may only be made by prior arrangements in writing. The deposit is due at the time of booking and constitutes your acceptance of the following terms and conditions. A separate, refundable security bond is also payable prior to arrival. This is refunded in full after your departure based on the property being left in good order. The full tariff is due in full as shown on your booking confirmation. Failure to pay this amount by the due date may result in your booking being cancelled. Two weeks notice is required for cancellations and during peak periods (school holidays, Easter, Christmas and New Year) one month’s notice is required. In the event you cancel your reservation within this time the tariff is not refundable unless the house is re-let for the same period. However this payment can be transferred to another date within the next 12 months. No refunds or credits will be given for cancellations within seven days of the arrival date. The security deposit will be refunded within 5 days of departure subject to the house, grounds & barbecue being left in a clean and tidy state. Any additional costs incurred, including but not limited to, breakage, property damage or excess cleaning will be deducted from the security deposit. Please also place books, DVDs and toys back in their shelves as the cleaners will charge additional fees for extra tidying up. Loss of keys will attract a $50 fee. Loss or breakage of the Telstra mobile wi-fi device and/or power cord will incur a $100 charge. The standard check-in time is from 2pm and check-out is 10am. We are happy to accommodate requests for an earlier check-in or later departure at no extra charge, subject to bookings. A fee of $50 per hour will be deducted from the security deposit for late departures not arranged in advance. The maximum number of overnight guests should not exceed the number stated on the booking confirmation. All parties are strictly prohibited. Disturbance to neighbours, including excessive noise from stereos, TVs, other electronic equipment or loud voices, is also prohibited. No noise should be audible outside the property after 10pm and before 8am. A $100 deduction will be taken from the security deposit if a noise complaint is received. If any subsequent warnings are given, guests will be evicted with no refunds. Smoking is prohibited within the house. If any of your group wishes to smoke outside, please ensure that cigarette butts are properly extinguished and disposed of in the garbage. Removal of cigarette butts from the lawn, garden, paving or pool areas will attract additional cleaning fees. Pets are allowed where arrangements have been made in advance. While the property is pet-friendly please note that the perimeter fencing is not fully secure. Dogs are not permitted to sleep in any of the carpeted bedrooms or on the lounges. No responsibility can be taken for the loss, damage or theft of any personal items during your stay. Every effort will be made to ensure the property is available as booked. However the owners reserve the right to make alterations due to unforeseen circumstances. Our family spent a week enjoying the estate. The house was everything we wished for and full of character and the grounds offered all that we hoped with a warm pool and beautiful trees and birds to enjoy. Only a few minutes drive from great shops and cafes. Fantastic holiday home with brilliant amenities....we had a wonderful time here! What a amazing home....plenty to keep the kids busy, beautiful layout and furnishings and wonderful hospitality. What a beautiful relaxing property. Amazing house. Lovely in every way. Great for families. I will be back. Pure relaxation in luxury surroundings. We didn't want to leave as the property has everything you need and more!. This is a really beautiful property which is surrounded by a magnificent garden that holds the space and the privacy perfectly. Super comfortable beds with quality linen made for the best night sleep I have had in a long time. It is all the little touches that makes this a really special place. The owner, Melissa, was an absolute delight to deal with. Thank you so much, we will certainly be back. Had a wonderful time at the house, it has everything you need. Great for families. Beautiful expansive garden, great kitchen, pool, trampoline, kids play equipment. The whole house is fantastic and private. Only 10-15min drive into Byron. Melissa was a fantastic host and communication was easy and reliable. Will definitely be back, thanks again!